Order your own copy of these expansions at your local retailer or online through our website today! 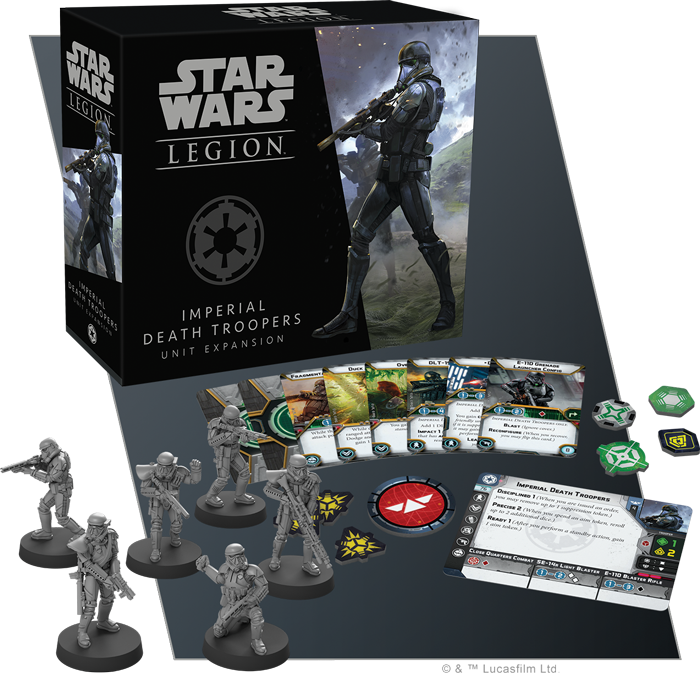 These expansions represent the pinnacle of Imperial might, allowing you to apply the results of the Empire’s research into advanced weapons technologies on the battlefields of the Galactic Civil War. With an elite group of ruthlessly efficient soldiers and a new commander who knows exactly how to use them, the Rebels won’t know what hit them. Every great achievement requires just as much ambition, and there are few as ambitious as Director Orson Krennic. As the head of the Empire’s Advanced Weapons Research division, he oversaw the creation of the dreaded Death Star, using it wipe out any trace of the Empire’s activities on Jedha. Director Krennic brings the same cunning that helped him build one of the most powerful superweapons the galaxy has ever known to the battlefields of Star Wars: Legion. In these fights, he’ll do whatever it takes to push his own agenda and ensure that his command cards win priority. Even better, Krennic’s position and skills entitle him to his own entourage of Imperial Death Troopers, giving you plenty of room for other special forces units in your army. 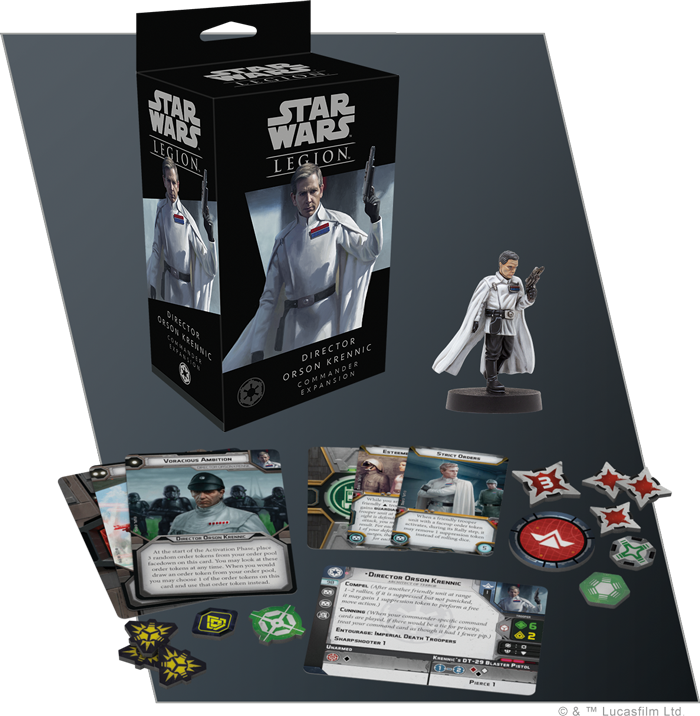 The Director Orson Krennic Commander Expansion includes one finely detailed, easily assembled Director Orson Krennic miniature ready to march his troops into battle along with three new command cards that allow him to issue specific orders in the thick of battle. Finally, three upgrade cards give you even more power to customize your commanders and their equipment. We’ll take a full look at everything inside the Director Orson Krennic Commander Expansion, including all three of his signature command cards, in a future preview! Tactically advancing across the battlefields like inhuman revenants, Imperial death troopers are a terrifying sight. Adorned in jet black armor and carrying an arsenal of weapons and equipment, these troopers are the elite soldiers of the Tarkin Initiative. Trained to be efficient and merciless, they are also rumored to undergo classified medical augmentations. Death trooper candidates are hand-selected from the Stormtrooper Corps by Imperial Intelligence itself and, as such, these elite troops display skills beyond those seen in other Imperial troops. Unfazed by enemy fire, death troopers wade into battle, firing with unmatched precision. They display so much discipline, in fact, that they can remove a suppression token when they are issued an order, keeping them pressing the attack no matter how much adversity they face. We’ll take a look at everything included in the Imperial Death Troopers Unit Expansion in a future preview! With the creation of the Death Star, the Empire has a weapon that can ensure its dominance for generations to come. 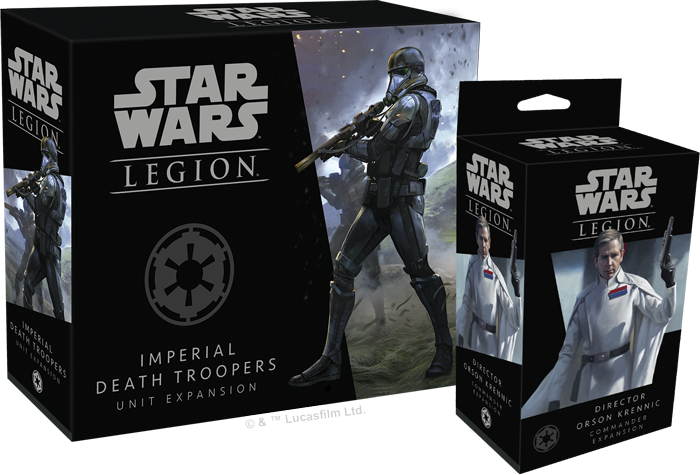 Add some advanced weapons of your own to the fight against the Rebellion with these expansions for Star Wars: Legion! 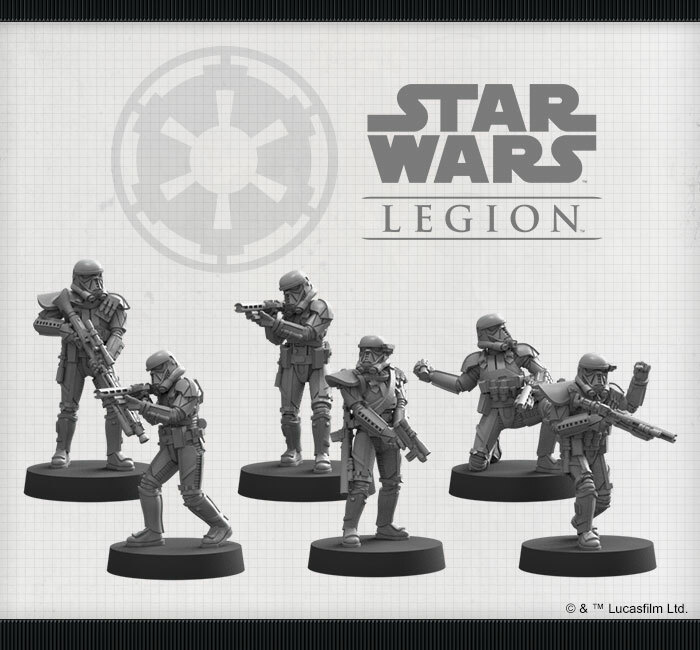 Look for the Director Orson Krennic Commander Expansion (SWL33) and the Imperial Death Troopers Unit Expansion (SWL34) at your local retailer in the first quarter of 2019. Pre-order your copy at your local retailer or online through our website here!